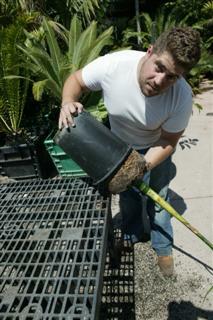 When a customer buys a palm tree at our nursery, they often ask "How do I plant it?". The simple answer of "Just dig a hole and put it in" is not the right answer. This is because there are many factors involved in successfully growing a palm tree. The process of physically planting a palm tree into the ground is only one of the important steps. There are other factors that determine success in growing a palm tree in any given locality. So, I shall present a top to bottom discussion on planting a palm tree and begin before you've even purchased the plant. On arrival and requesting palm trees, the first thing we typically ask these customers is "Where do you live". This tells us something about their growing conditions. Next, we’ll ask them how cold do they get during the winter. Unfortunately, many people don’t know the answer to this question. Then we’ll ask if the plant will be in full sun, partial sun, or shade. Different species like different conditions. Finally we’ll inquire about any specific species they know of and like, or get a feel for a “look” they prefer. Palm trees have a wide spectrum of size and appearance and one must balance the predictable mature size and characteristics of any given species with the customer’s needs. With the information above, we can make knowledgeable recommendations of species that may do well in their garden. Thus, before you just go out and buy a palm tree, make sure that it’s the right plant for your garden’s conditions and needs. For instance, if there are utility wires overhead, one wouldn’t plant a species that gets real tall. 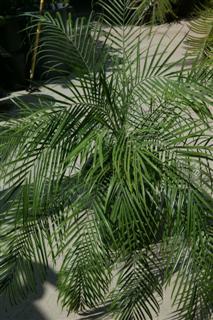 Or, if one has a very small area, one wouldn’t plant a Canary Island Palm or a Mediterranean Fan Palm. Or, if the area is in the shade, one wouldn’t plant a Triangle Palm. These are all basic mistakes that can be avoided. So, let’s discuss all the basics about selecting and planting a palm tree so that you will have success and enjoy the tree for decades to come. This is probably the most important factor in successfully growing a palm tree. And it is a very exhaustive topic as there are over three thousand species of palms. 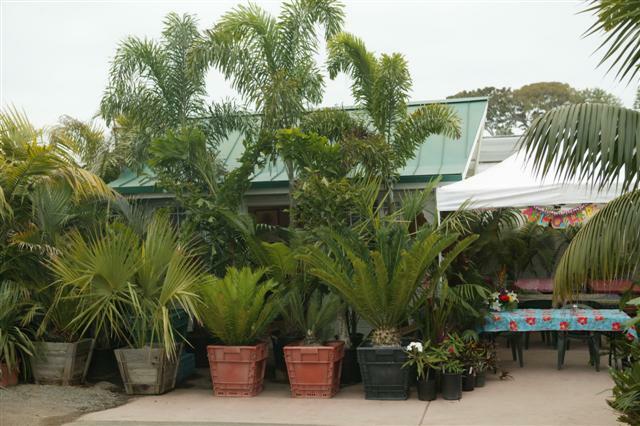 Unless you want to spend hours or even days researching the topic, it is often best to go to a reputable nursery that specializes in palm trees. Such a nursery will really know their trees while typically the large retail stores know very little about the palms they sell and are not geared to provide cultural knowledge to the customer. And, they typically don’t know how to guide customers when cultural problems arise. Because of this fact, we get at least ten calls a week from such customers who are having problems with the plants they bought elsewhere. Starting with a specialty palm nursery might avoid such difficulties. Tolerance of sun and cold are the most important factors in selecting the right species. Many species don’t want full sun while others demand it. Some palms don't like real cold weather. Other articles at this Site will help educate you on these points. Or, if you don't have time to research it yourself, just drop by and we’ll guide you in your purchases. One final point is that it is preferable to buy nursery stock that is locally grown in your area. Often imported plants brokered in from more tropical areas (Florida or Hawaii for example) and sold through big outlet stores perform poorly. Locally grown palms might have seen years of our colder Southern California weather and this improves your chances of success. The customer has to decide what size plant he wishes to purchase. Some people prefer buying small palm trees and "watching them grow". Others prefer a medium sized plant that is "something to look at right now". 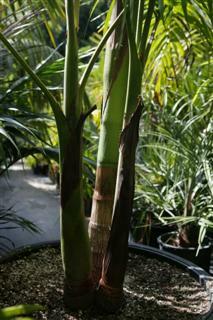 And, when finances permit, some prefer larger plants or mature crane sized palms that offer instant gratification. 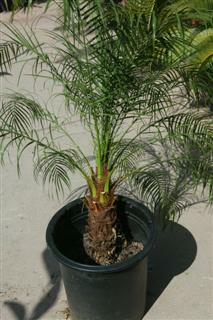 There are advantages and disadvantages to each size of palm plants. Small plants (band size and one gallon) are inexpensive but will take quite a few years before they look like something. They may also be more vulnerable to cold. Medium sized plants(5 and 15 gallon size) are sturdier and probably improve your chances. Larger plants (20, 25 gallon and boxes) are wonderful if one's finances permit such a purchase. Acclimation is typically easier with larger plants. And, at the far end of the spectrum are the plants that are dug from somewhere else and craned into your yard. Such plantings are extremely expensive and sometimes disruptive to the garden. We sell the first three groups of plants mentioned above. 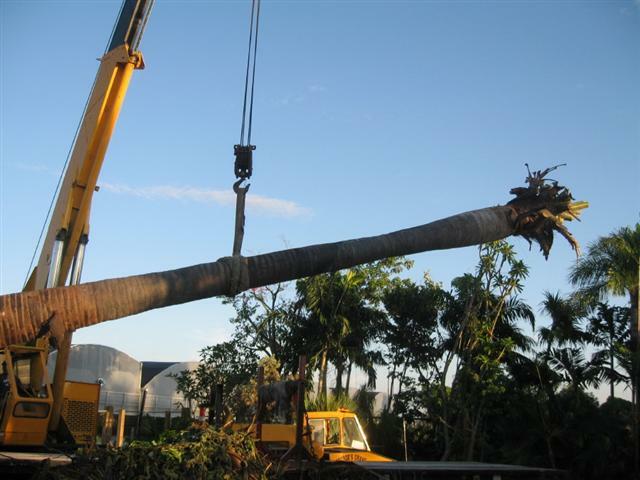 People who only dig and crane large palms are known as "relocators" or "diggers" and are not true nurseries by definition. We work with some of these latter specialists and give referrals when needed. In general, as the size of plants goes up, the availability of species goes down. The rarest of species are seldom available in the largest sizes. This varies from nursery to nursery. 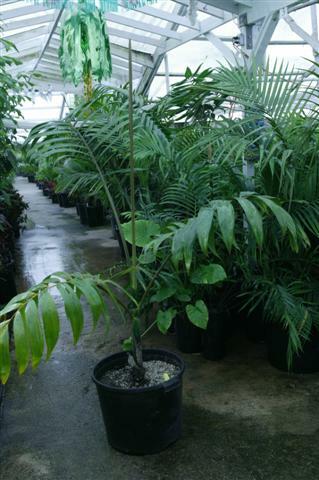 At our nursery, in the 24 inch box size and below, we offer about 800 species of palms. It is almost impossible to find an extremely rare species in the crane size. This is because the rare species are either not available or not for sale. But, remember that all sizes will eventually end up giving the same mature plant if grown well. It's merely a question of the customer's patience and financial capabilities. Our most popular size sold is the 15g. It is big enough that you appreciate the plant and is still affordable for most. If you get plants larger than a 24 inch boxed size, be prepared to use heavy equipment to plant. Men can lift and transport a 24 inch box size. 30 inch boxes are near impossible for men to lift. Above this one needs a tractor or crane. And, this dramatically increases your costs. As mentioned, the most popular size we sell is the 15 g plant. (see illustration). It is easy to lift and move and not that difficult to plant. When you drop by, we can often show you various sizes so you can make your decision on the spot. When you buy a palm tree, pay attention to the growing conditions that the plant was in when you purchased it. 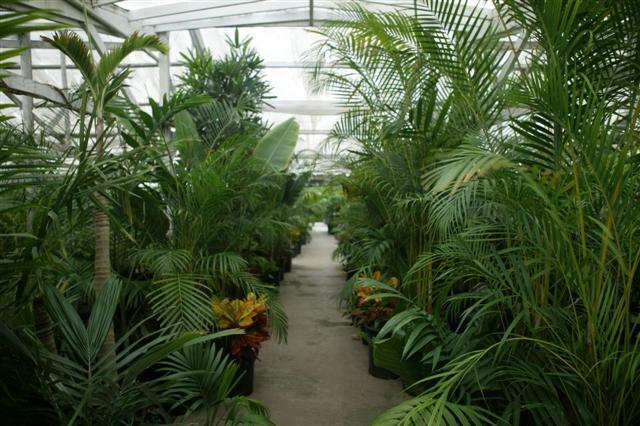 Sometimes you might purchase a palm tree that was grown inside a greenhouse or under shade cloth. This is quite common. If you plan on planting a palm tree in full sun in your area, it will need to be acclimated to your conditions for optimal performance. People do this all the time. This process can take six or eight weeks but will assist you in avoiding sunburn to the leaves. Also, remember that localities for inland or in desert areas are much different than coastal climates. Even if a palm was in full sun along the coast, your sun may be brighter and hotter. 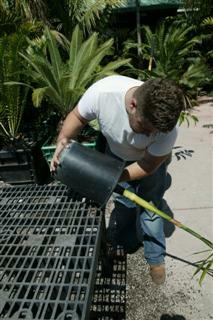 Trained staff at a reputable palm nursery will guide you on acclimation requirements. 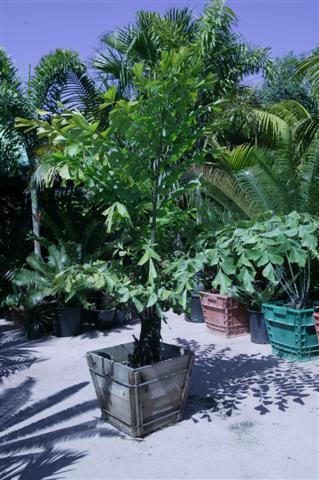 An alternative to acclimation in the container is to plant the palm into the garden. One then builds a temporary shade cloth protector above the plant. As time passes, one cuts holes in the shade cloth to allow a gradual increase of sun through the filtering cloth. Eventually full sun is achieved. This process is a bit more work, but the plant is growing and establishing roots while one is waiting for acclimation. There is controversy over this issue. Traditional thought is to plant more tender or marginal species from Spring to Fall. This avoids a palm’s throwing new leaves during the coldest months. Others would argue that planting when it’s cold gives the plant’s roots time to grow and establish strength for rapid Spring growth. If you are in an extremely hot area like Palm Springs or Las Vegas, avoiding planting during the extreme hot months might be warranted. However, there are very sturdy species that can essentially be planted any time of the year. It’s probably best to check with your palm expert at the nursery when you buy your plants. 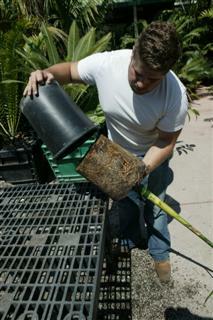 If you decide wait to plant your palm, this gives you ample time to fully acclimate the plant to the desired location. This is an important issue because it deals with the question of water drainage and how you will water your garden. By “water drainage” I am talking about what happens to the water you apply to the ground or what happens to the rain that one receives. Does water stay around or does it travel downwards or away from the plant? Sandy soils have better drainage. Clay soils tend to hold onto water and have less ideal drainage. In some cases, clay soil can be very nutritious. But, if an area is always boggy with water, this may limit success on growing your plant. Clay soil can also turn into a “block” if allowed to dry out. Soils that have a lot of decomposed granite tend to have adequate drainage. Or, rocky soils typically drain well. If you don’t know which type of soil you have, you can typically find out by just examining your soil. Dig a hole an look at what you shovel out. Is it sticky and thick? (clay) Or, does it appear open and easily broken apart with touching? (sand). Wet the soil. Does it stick to your hand like peanut butter and require washing with water to get off the hand? (clay). Or, can you merely brush the soil off your hands by rubbing them together? (sand) If you place some in your hand and compress it, does it leave a tight wad of soil with finger indentations? (clay). Is it very dense and heavy? (clay) When you dig, are there a large number of rocks of various sizes? (rocky soil). This makes digging harder, but typically this type of soil drains well. One can, over time, change the characteristics of the soil you have. This is accomplished by adding amendments to the surface of the soil. Over time, these amendments work their way into the soil and enrich the soil and improve drainage. The amendments one uses when preparing the soil for planting are different for clay or sandy soil. (see below). 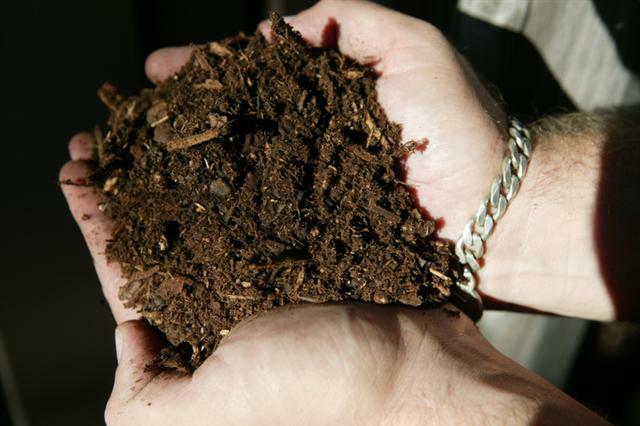 Why do we ask you about your soil type? Because it is one of the factors involved in garden drainage. And, in general, plants like good drainage. The best scenario is to have a sandy soil with a bit of slope or incline to the garden. The water doesn’t pool and typically moves to lower areas. Plants prefer this as they get a drink of fresh water when you irrigate the garden. If you are in a low lying area (bottom of a valley), have clay soil, and your garden is perfectly flat, you are probably going to probably have drainage problems. Consider this: a hole dug for a palm might collect excess water that collects at the bottom of the hole and gets putrid over time. In other words, you would have a funky swimming pool at the bottom of the hole where the water is never flushed away or circulated. It’s hard for anything to thrive given this situation. A simple test for drainage is to dig an experimental hole in your garden. Dig a hole about 16 inches deep with a shovel and rapidly fill the hole with water from your hose. Observe how long it takes for the water to disappear. With excellent drainage, the water will disappear within an hour or two. Acceptable drainage would be for the water to disappear within twelve hours. If, after a day or two, water is still in the hole, you have a drainage problem. Potential remedies for the latter problem include drilling holes in the bottom of the hole with auger bits to “break through” to better drainage; utilizing French drains to divert the water to lower areas; “building up” the planting area so that the roots are above the water table; or installing a pipe into the hole such that excess water can literally be sucked out of the hole with a pump or siphon. The addition of gypsum to the bottom of the hole may be beneficial but will not solve a major drainage problem. The question arises as to whether one should add amendments to the native soil in the garden prior to planting. This is a topic that even the experts don’t agree upon. The “do nothing camp” would argue that your plant eventually has to grow in your native soil and that amendments are postponing the plant’s eventual need to “grow in what you have”. Those that prefer amendments would argue that these additives help the plant’s roots expand and grow first into the amended soil and then into the native soil. We tend to prefer that you amend your soil when you plant a palm. The amendments available will vary on where you live. In our locality, we use two things: organic material and sand (if needed). By organic additives is means some type of wood or organic product that have been ground or decomposed into a finer material. Examples would be redwood or fir shavings, bark mulch, ground bark, sawdust, aged leaf matter, aged lawn cuttings, etc. These should be aged and often need to be “nitrolized”. The latter means adding fertilizer to the material because Nitrogen is actually consumed during the decomposition of such organic mater. Manufacturers typically will spray a dilute nitrogen fertilizer into the material to make up for the anticipated nitrogen loss. Regarding sand, typically the larger the grains of sand, the better the drainage. We prefer #12 grit sand. #16 grit is much finer but will work if that’s all you can buy. Amendments are added directly to the pile of soil you dig from your garden. They are mixed into your soil with the shovel. The ratio of additives is as follows: For Sandy Soil: For every three parts of your native soil, mix in one part of organic material (fir shavings, etc.) For Clay Soil: For every three parts of your native soil, mix in one part of organic material and one part of course sand. It might be mentioned that nowadays, organic gardening is much more popular. This involves such things as worm castings, organic manures, composted “teas”, etc. This topic will be addressed in a future article but may be something the grower wishes to research. Other materials can be utilized to amend your native soil. Many times this depends on local availability of materials. Such alternatives include other wood types of mulch (Coconut products, Cocoa bean products, cedar bark, pumice, scoria, and gravel). Remember that these products purpose is to enrich the soil and to promote drainage. If one chooses not to amend the soil at all, one would repack the hole around the root ball with the removed native soil. But, still follow the watering pattern discussed below. We typically recommend digging the hole six inches wider on all sides and six inches deeper than the plant’s existing root ball. One determines the root ball size before digging by using a tape measure. It is the width of the pot (not counting the overhanging lip) and the height from the ground level at the top of the pot to the bottom of the container. Thus, if the root ball is 14 inches tall, one would dig a hole approximately 20 inches deep. Remember that the soil dug is thrown to the side for adding amendments (above). We typically do not recommend adding gravel or rocks to the bottom of the hole. People that do this will comment that it “promotes drainage”. But, if you think about it, drainage is determined by the characteristics of your soil (addressed above). If you have terrible drainage, a few inches of gravel solves nothing. Sometimes digging the hole can be difficult and digging bars, picks, or even jackhammers are needed. 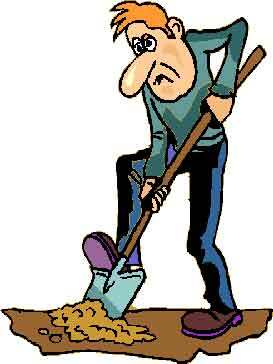 If you soil is very difficult to dig, you may have areas of sandstone or other dense material. If this is the case, it is imperative that you check your drainage! I might mention here that some have advised putting vertical pipes into the hole for the mere purpose of providing "deep watering". The concept is to add water to the pipe and water goes to the bottom of the hole and waters the deepest roots. Although this may be advisable under some circumstances, I know of few people who actually do this and most grow their plants perfectly. I would not recommend it as a standard practice. An exposed 5 gallon root ball. Notice how one can measure the height/width. 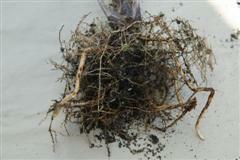 Your goal while removing the root ball from the container is to do minimal damage to the roots and root ball. With smaller plants (up to 5 gallon size), we recommend inverting the plant upside down and tapping the edge of the container on a table or hard surface. Typically the root ball will just slide out of the container. With larger plants such as 15 gallon up to 25 gallon, one can typically lay the plant on a flat surface and gently slide the root ball out of the container. You might have to tape the sides of the container with a mallet to loosen it up a bit. If a root ball is “locked” into the container with massive roots, one can carefully cut the side of the container being careful not to simultaneously cut the roots. Large knotted up roots coming out of the drainage holes of the container may require expanding these drainage holes with a pair of pruners to allow the roots to slide through. If your plant has long, healthy roots coming out of these holes, try to protect them while removing the root ball. If you have a boxed specimen, these plants are usually stood up vertically close to the hole and the box is disassembled, sides first. The bottom of the box is removed unless it is so entangled with the roots that this is not possible. Have adequate manpower to put the heavy root ball into the hole and check your vertical measurements prior to placing the plant. Otherwise, you may have to lift the plant back out if it’s too low or too high. Being accurate on your measurements can avoid headaches or poor growth later. WHAT’S THE RIGHT PLANTING DEPTH AT THE SOIL LEVEL? 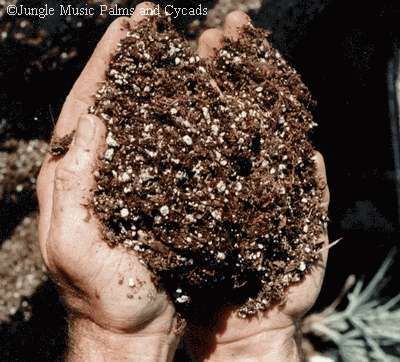 Most people plant their palm so that the soil level in the container matches the soil level of the garden. But, you might want to plant it an inch or two deeper to create a “watering well”, which is actually a shallow hole in the surface for water to collect and drain down to the roots. This is particularly true for those who will do hand watering. One definitely does not want the root ball higher than the garden soil as this will end up exposing the roots. Such plants are said to be “on their tiptoes”. Plants with their roots showing tend to be unstable and wind can actually blow them over. When roots are exposed, you should plant the palm a bit lower so that when you cover the exposed roots the plant is not too high in the hole. See the photograph for an example of a plant with exposed roots. The opposite is true as well. Don’t plant the root ball so that a significant portion of the trunk is below the ground level. This potentially can lead to rot and death of the tree. Accurate root ball measurements insure that the plant is perfect for your needs. Remember that the pot size is not the same as the root ball height. Plants in containers typically have a few inches of space to hold water. When you measure root ball height, measure from the bottom of the root ball to the top. If a root ball is irregular or falling apart, you will have to adjust accordingly. One can actually suspend the tree in the air in the hole and gently pack soil around the roots of a misshaped root ball. This is very common when planting cycads. 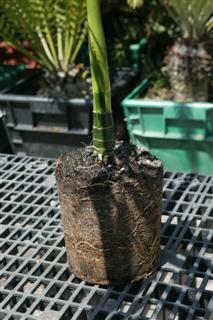 A containerized palm showing exposed roots. These roots would be covered when planting..
One now takes their soil blend (see above) and adds it to the bottom of the hole. Compact this soil by jumping on it on hitting it with your fist or an appropriate tool. Before you put the plant into the hold, you should water this soil. This will help compact it even more. You may have to re-pack the soil. Recheck your hole’s depth with a tape measure. If you don’t do this initial compaction step above, the entire root ball may “sink” into the hole over time and you end up with a plant that’s too deep into the ground. If you don't measure the depth accurately, your plant may be too high or too low. We typically do not think gravel or sand is needed in the bottom of the hole. A triple King Palm. Position the trunks for best appearance when planting. You now take the plant with the exposed root ball and carefully put it into your hole. Check to make sure the trunk is vertically straight. Center the root ball into the hole. You may wish to rotate the plant so that it shows best toward your viewing vantage point. Remember that every plant has a “front side”. This is typically the side of the plant that has seen the most sun. Growers usually put this side facing them from their point of observation. Or, expose the "front" to the most intense sun. If one shows the 'back" of the plant to the most intense sun and the underside of the leaves are exposed, one can be sunburn on those leaves. (see photo) If the plant is a multiple, decide if you want the smallest plants or trunks toward the front (most popular), or toward the back (more hidden). With some plants, if you plant it facing the “wrong way”, the resulting plant just doesn’t look right. With practice, one can learn to recognize the front of the plant and thus properly place it into the hole. This is the final opportunity to make sure the top of the root ball is at the right elevation compared to the native garden soil. Adjust your planting accordingly. I am frequently asked by customers if they should treat the roots in any fashion prior to planting or if they should splay the roots apart before putting the palm in the ground. This is typically not necessary. The picture below shows a root ball that has been intentionally splayed apart. My opinion is that the damage one potentially does to the roots by doing this outweighs any benefit from doing it. Roots can be torn or damaged. Roots will eventually find their way out of the root ball and work into the adjacent soil you have provided. 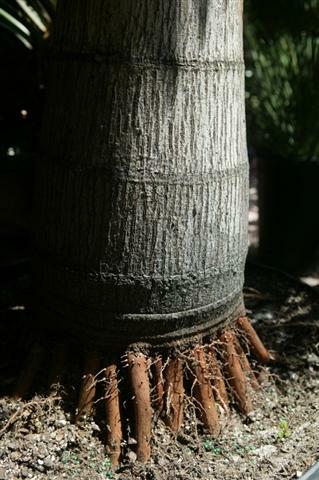 The "back" of the same Pigmy Date Palm. Note how it doesn't appear right. This is one of the most important steps of planting. 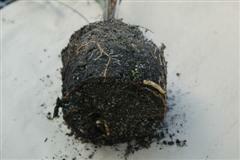 We recommend using your soil mixture to fill around the sides of the root ball halfway. You then pack the soil down with your fist or a mallet and water it. This allows water to surround the central portion of the root ball. You then fill the remainder of the area around the root ball to your desired height and water it again. You will see that this means you water the bottom of the hole, the center of the hole, and the top of the hole. This three step watering process guarantees that the root ball will receive ample watering after the shock of transplanting it into the ground. There’s another important point about watering. Often one sees a root ball that has a greater physical density than the surrounding mixed soil used to fill the hole. This can result in water bypassing the root ball altogether. You can see that, if one doesn’t do the three step watering above and only waters after the root ball in placed into the ground, that water could go around the root ball and into the bottom of the hole and totally miss penetrating the root ball. Because of this we recommend you set your watering hose on a slow trickle and place this at the base of the planted palm. Leave it there for about twenty minutes. This slow trickle of water will penetrate the root ball and not have the force to go around it. 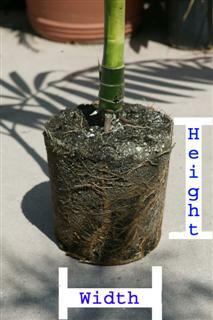 Many people like to put garden mulch over the base of the palm after planting. This can conserve water and eventually enrich the soil around the plant. DO I FERTILZE THE PLANT WHEN I PUT IT INTO THE GROUND? In general, the answer is “NO”. 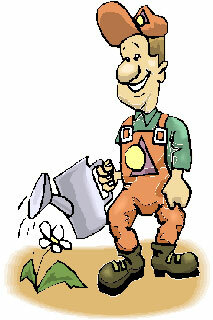 Remember that transplanting is a shock to the tree and fertilizers, especially if incorrectly used, pose another shock. The double threat is not worth the benefit received. 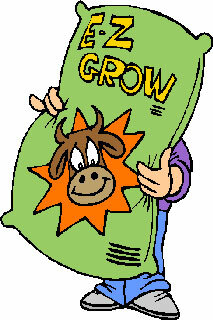 We recommend holding off on fertilizer for six to eight weeks after planting. And, we caution against the unpredictability of fertilizer spikes planted close to the roots. If one insists on fertilizing when planting, utilize a slow and safe fertilizer like blood meal. WHEN DO I WATER THE PLANT AGAIN? This, of course, depends upon your local weather and soil conditions. If it’s really hot, water frequently. If it’s cool, adjust accordingly. As a rule, we typically recommend watering it when you plant it as above (day 0) and repeat watering on days 2, 4, 7 and 10. If you live in a hot inland area, you might want to consider water every day or two for about two week. Then get back into your regular watering program. It's important to emphasize again the goal in watering: to maintain adequate moisture around the roots. Many might think that if they set their automatic sprinklers for several minutes a day that this will be adequate. But, this amount of water at best will only travel an inch or two into the soil. This may not be adequate. What you're trying to do is to replace the water loss from the soil from evaporation and usage by the tree. If you underwater, the lower areas of the soil will eventually dry out and the plant will looked stressed and not be attractive. It is typically best to deep water less frequently than lightly water more often. If you have a watering well, try to fill the well three times in succession. WHAT ABOUT VITAMINS AND PLANT STIMULANTS? In general, such things are not needed. Can they help give better results? Possibly. They certainly don’t hurt. This includes things such as B Vitamins, Superthrive, foliar sprays, etc. If you like to do everything you can, give them a try. I should make specific mention of the antitranspirant agents. These are sprays that put a protective coat onto the leaves and help prevent plant desiccation. A product named Cloudcover is an example of such a product. From a theoretical point of view, their usage seems to make sense. I know of few growers that use them on a regular basis, but I have utilized them with good results on planting palms in the past. These sprays deteriorate over weeks or wash off the leaves after a few rains. You should watch your plant carefully after you plant it. This particularly involves checking to make sure the soil isn’t drying out too much. Keep up with adequate watering. If you didn’t acclimate the palm to your conditions or hurried the acclimation process, within a few days to a week you might see signs of sunburn. This begins as a faint chocolate brown color to the leaves and ends with dry, necrotic areas to the leaves. You can diagnose this because it is worse on the leaves or leaflets that get the most sun exposure. Hidden leaves will not show the sunburn. Be aware that the nice leaves you’ll see on the plant in about a year are typically not the leaves that are on the plant when you put it in. Plants will typically steal nutrition from lower leaves to produce new leaves. Therefore, it’s a normal progression of things to see the lowest leaves die off while new, beautiful leaves are formed. 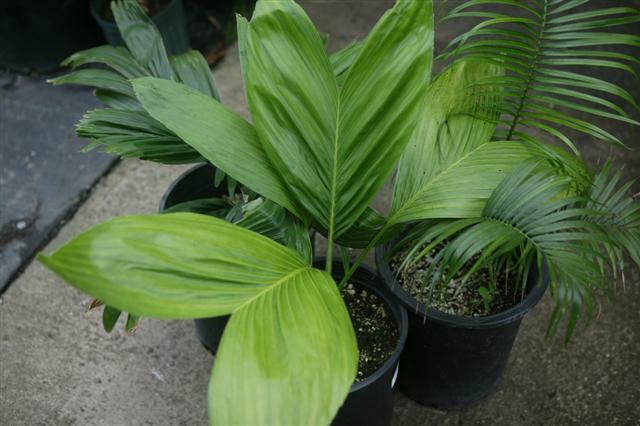 If you notice that new leaves are burning or looking bad after they emerge, check to see if you have given that palm too much sun (more than desired) or are under watering. Or, the latter could be secondary to added fertilizer which we do not recommend applying when you plant. 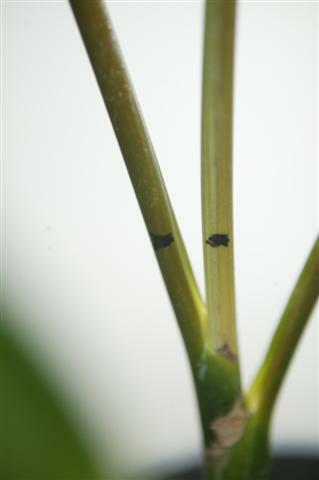 To check for growth of the palm, one can use a magic marker to mark simultaneously and side by side the newly emerging leaf spear to an adjacent old leaf petiole. 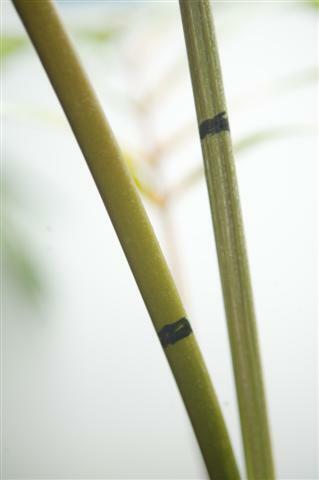 The spear should lengthen in comparison to the mark on the older petiole. During the growing season, this can be as much as one half to one full inch in 24 hours. But, any movement means that growth is occurring. Above we have presented a fairly comprehensive discussion of a rather simple topic: planting a palm. One can see after reading this article that there are many things to consider. Most important is getting a healthy plant that will grow in your area and under your conditions. Beyond this, one must consider acclimation, soil composition, amendments, drainage and positioning of the plant. Proper application of water is another important point to culture, especially watering patterns right after planting. Once one learns the basic principals of planting palms, it becomes second nature. And, when done correctly, failures are rare. We wish everyone success if their garden and hope that the information above is helpful.